On January 2, Xi Jinping, president of the People’s Republic of China (PRC), made a high-profile speech specifically on Taiwan policy at Beijing’s Great Hall of the People. Since Tsai came into office in May 2016, cross-strait relations have been going downhill dramatically. Beijing has consistently increased pressure on Tsai’s administration solely for her refusal to publicly embrace the 1992 Consensus. Now, Beijing is surrounded by multiple challenges and potential crisis: The economy is slowing down; many private companies are closing down; the relationship with the United States is deteriorating; and the conflict between different classes within the nation is growing. Against that backdrop, what Beijing needs most is to divert local people’s attention as well as anger and anxiety away from those domestic problems and toward some other distant issues. The cross-strait relationship is the best subject: it can quiet opponents’ voices, stir the nationalists’ passion, and help the top authorities consolidate the power. Tsai’s latest resolute and public rejection of the 1992 Consensus gave Beijing the perfect excuse to enhance its squeeze on Taipei and, at the same time, avert attention from domestic issues. Most importantly, Beijing has numerous measures at hand to up the pressure — further cutting Taipei’s ties with the international community, grabbing away more of Taipei’s remaining allies, and sending more aircraft and warships to surround the island, to name just a few. On Taipei’s end, Tsai has to face the fact that her administration does not have much leverage to resist Beijing’s pressure now, unfortunately. 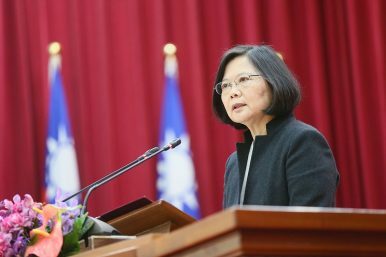 Other than calling for the help of the international community, particularly the help of the United States, Tsai has few cards to play. Will the United States defend Taipei against Beijing? Based on recent developments, it seems that the United States has been already standing on Taipei’s side. For example, U.S. President Donald Trump recently signed the Asia Reassurance Initiative Act (ARIA) into law. The Act calls for stronger official exchanges and military ties between Washington and Taipei as well as other U.S. allies in the Indo-Pacific region. But the Trump administration is not reliable. Trump’s “America First” policy makes it clear that the interests of the United States are its top priority, while those of allies sometimes can be sacrificed. Keeping this in mind, Taipei should not put all its eggs in the U.S. basket. Thus, for the sake of pragmatism — which is one of the must-have skills for a politician — it’s better to live along with Beijing rather than offend it publicly. Mainland China’s former leader Deng Xiaoping’s strategy for diplomacy might be enlightening for Tsai’s administration now: Observe calmly, secure your position, cope with affairs calmly, hide your capacities, bide your time, and maintain a low profile. Xi Says Taiwan ‘Must’ Unify With China as Tsai Unveils Her Own ‘Four Musts’China and Taiwan Leaders Emphasize Kinship, 1992 Consensus in Historic TalksThe Ma-Xi Meeting: What We Know So FarHow President Xi Jinping Is Misreading TaiwanWhat Does the 1992 Consensus Mean to Citizens in Taiwan?